The True North Youth Foundation (TNYF) recently embraced a new NHL initiative for children who have never been exposed to the game of hockey. Children between the ages of 8 and 9 are carefully chosen to by the school division to attend the program once a week for ten weeks at their local community arena. The children are provided with free equipment from the NHL over a ten week period and are also being monitored by Hockey Canada and Hockey Manitoba. Not only will they watch the children’s individual progress during the program, they will continue to do so to see if they still skate and/or play hockey once the program has finished. Approximately 400 children participated in the inaugural season of the Learn to Play program. Justin Kurtz, Local Manager, and Thomas Steen, Local Coordinator, are in charge of the Learn to Play program and teach the children the skills they need to learn to how to skate and play hockey. Having two former professional hockey players as coaches is very fitting for the program as they both have a vast amount of knowledge and experience. Additionally, they bring awareness to the community and that helps motivate the children. Kurtz and Steen live in Manitoba, teaching this program is a way for them to give back to the community. Thomas Steen, former Winnipeg Jet and Learn to Player Coordinator, says that he teaches because of his “love and passion for the sport”. Teaching the children brings him as much personal satisfaction as playing hockey minus the competiveness of the game. Teachers and parents sat in the stands watching their children evolve and build self-confidence. Every week Kurtz and Steen received praise from parents in the program saying how grateful they are for their child to have this opportunity. Justin Kurtz, Local Manager, says “seeing how far the children have come since the first lesson and the week to week improvements they make is very special.” Dwayne Green, Executive Director of True North Youth Foundation, says, “the program has allowed the foundation to expand our reach to schools in communities that haven’t been able to participate in the Hockey Academy.” Similar to the Winnipeg Jets Hockey Academy, Kurtz and Steen rely on volunteers to help with the program. 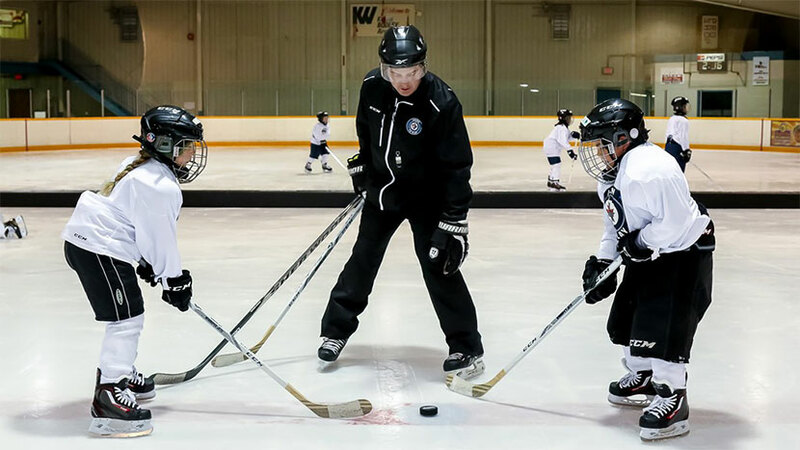 Volunteers help get the children ready on and off the ice as well as running drills. Individuals volunteering include parents, teachers and alumni hockey players. At the halfway point of the Learn to Play’s first year, Steen says, “It’s very rewarding to see the children get excited. Witnessing the children’s attitude change and seeing how they become more excited and talkative is one of the most satisfying and humbling moments of the program.” Steen adds, it is one of the most noticeable differences between being a player and coaching. As a coach you are more involved with the children through training and instruction, resulting in the ability to see and partake in a child’s milestone. Justin Kurtz’s perspective on coaching is “having the ability to focus on teaching and having patience.” Having those skills will help you prepare the children grow and succeed. Dwayne Green, Executive Director of True North Youth Foundation says, “Any time the TNYF can create positive partnerships like we have for the Learn to Play program with the NHL, NHLPA and the various school divisions the impact for the youth is immeasurable. To see a child improve their hockey skills is one thing but to find a way to show youth with hard work and dedication they can achieve great things the positive feeling will move beyond the hockey rink.” Creating partnerships like this will enhance the TNYF and allow for the opportunity to reach more youth. Next year, the program will expand to three school divisions and over 1,000 children will experience and learn what playing hockey is all about.